D.B.A. Bat Cave River Cottages In NC. This brand new 1 Bedroom Bungalo GETAWAY is located right on the Rocky Broad River. This home was built in the early 30's and with the new remodel, GRANITE COUNTER TOPS, TILE FLOORS,Living room & Bath, Large throw rug in living room, you have all comforts of home. The peacefulness of the river lulls you to sleep at night. Sliding Glass doors with Blinds in the glass open up to your Large Rear Deck. There is a 40 x 16 private covered rear deck with a 6 person private Hot Tub W/Waterfall overlooking the river. Just added a Human Touch FULL Massage Chair Hot Tub then a Massage GREAT! There is an area down by river for Bon Fires, ask desk for details. There is WiFi available. There is a table inside for eating also for 4 & a table for 4 on the rear deck. 2 Lane nice paved road now. If you just need a romantic get away, we have the place for you! The Queen size bed features a new Tempur Pedic foam mattress. There is also a full living room area to sit and relax in. With a New 32In. VIZIO FLAT SCREEN TV & (Direct Tv & Stereo. Or you have a spectacular view on your private patio with swings or a small bistro table to sit at and enjoy a nice lunch or dinner. Just steps from the river makes a great time for swimming or fishing. Trout fishing is a lot of fun with a river stocking taking place once a week. Only a 1/8 mile up stream or 1/10 mile down stream you are sure to enjoy throwing your line out to see what you pull in. Sit and relax by reading a book or watching the bats and birds feed, Otter, Mink, Muskrat, Beaver, Herring, Ducks, White Squrril, along with other wildlife. The area is great for Motorcycles, and group tours are available (ask for more details). We ride and have circled the US on our bikes back in 1999 28,000 Mi. in 3 months. It was a trip that we will never forget and have met some of the nicest people by just getting away. Many have become life long friends. This area in the mountains has so many hidden treasures, come and let us show you just a few. We always love to ride the mountains, When we came across this available property I said you can buy on a mountain , Build a lake BUT you can not build a River. We have Mink, Beaver, Otter, Duck's , Geese, Herring, And all the White Water Sound and a nice cool breeze off the river, Can't be duplicated. Bat Cave Has Approx. 300 full time residents, No Red lights, About 4 Stop signs ? The 16ft.X 40ft. covered Deck is only 10ft. above & 10ft from the river edge. This property is on the Rocky Broad river. Trout fishing is a lot of fun with river stocking taking place once a week. Right from our backyard you can enjoy the catch of the day. Trout fishing licences are available by just calling 1-888-248-6834 if you forget. Couch, Fold down futon, Massage Chair, TV. Gas grill on Private 16x40 covered deck. With your efficiency kitchen inside, you have a dutch oven, a micro-wave, a double hot plate and a crock-pot, your own ice maker that makes ice every 7 minutes. The covered 16x40 rear deck has 2 ceiling fans and is nice in the summer time to shade you & extended deck for SUN There is a bistro table with chairs along with swings on your private deck that sits 12, if you want the sun, you are just steps away from river or the 10x10 open deck for sunning. 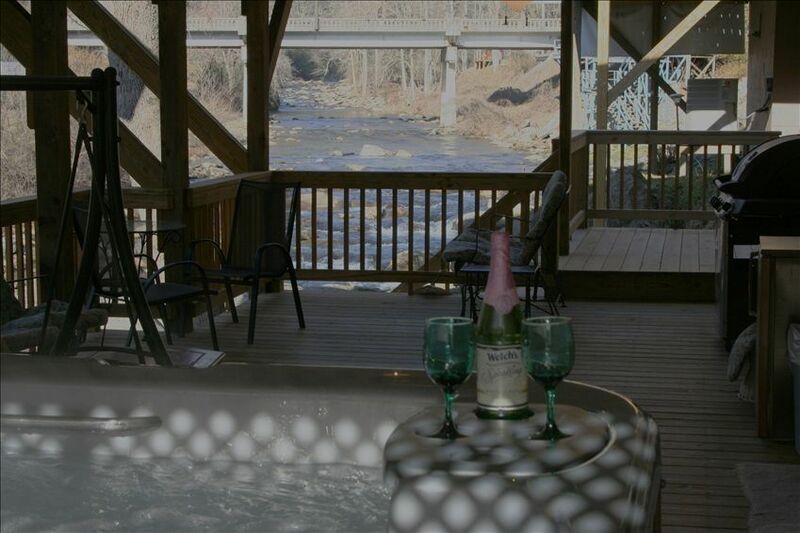 Or you may want to just sit in the hot tub and watch the river go by as you relax for your stay. Water shoes are recommended if you are going in the river. Your Private 6 Person Hot Tub is sitting on your Private 16ft.X40ft. Covered Deck that sits Just 10ft above & 10ft from the river water. You have 3 ceiling Fans w/Lights spaced along the Deck. We also have 2 Flood Lights that are Pointed at the river at Night & also Motion Detector Lights on 1 end of Deck by stairs & Solar lights pointed on the steps, We also have wooden steps that go from the Deck down to the water edge so you are not put in a DANGEROUS Position getting to the water. GAME WARDEN said remove raft because of Kayakers ? Your on little water park just behind the rental unit. We loved our 2 night stay on the river! They even gifted us with a wonderful bottle of wine for my hubby’s birthday! We pretty-much lived on the deck, it was beautiful. Thanks Bruce & Marion! We will return! This property had everything we needed to have an enjoyable, relaxing weekend! My husband and I stayed for 3 nights for our 10th wedding anniversary. We loved that it was so close to Chimney Rock and pretty Central to all the places we had planned to visit while in town. The property itself is the downstairs portion of a home with a rental above as well which at first was a little disappointing as I was looking for more privacy but it turned out that it wasn't too bad, we were there off season and there are blinds outside to provide more privacy. We really enjoyed ourselves. The place was nothing fancy but the bed was comfortable and the amenities were spot on, the massage chair was an unexpected bonus. The view from the deck are amazing and there was even a duck that visited us everyday! The only thing that put me off a little was the cleaning list left in rental. I don't recall reading anything saying we were responsible for cleaning(not that I mind but didn't really want to, would have liked the choice) or we would be billed so if you're looking for a place where it's cleaned up behind you, be warned, we were surprised to find out our rental did not include cleaning and it was our responsibility or we were being charged. We never met the owners or even stepped into an office so getting the actual rental was an easy process and the owners were very responsive and helpful, nice people. We would definitely stay again, there is so much to do nearby and we enjoyed our time and we're thankful for a comfortable place to stay on our trip! We had a wonderful inviting time. It was extremely easy. We are thankful to have found such amazing people. Thank you! We would stay again! The property was NOTHING like the description or pictures. In short it was horrible. We did not even get to stay one night. Upon arriving we found the cabin nothing like the pictures. There was a cheap, fleece blanket covering the bed, it looked worn and dingy. The furniture was uninviting, uncomfortable and not at all what we expected as we were there to celebrate our anniversary. The shower didnt appear very clean. We could had bought new bedding, and we could had cleaned the shower. There was little we could had done to make the furniture more comfortable or desirable to sit on. But the biggest issue was that we could not get the heat to work. A closer look outside we found the unit completely frozen over. I sent multiple emails to the owners and have yet to hear from them. We never unpacked our bags from the car and we was there long enough to know we would not be spending the night there because it was too cold to stay without heat. After frantically searching we found another place to stay. So we did not enjoy our stay, because we never stayed. The owners have still not responded to us. I hope you can do something to make this situation right. This was a disappointing start to a weekend I had planned for our one year anniversary. What she didn't like her new husband booking something on the river in Jan. and 23 degrees outside to sit on a back deck to enjoy white water and river breeze. it was 77* inside heat was already on. Overall the stay wa pleasurable. The exterior is a little worn. The interior was excellent. Overall it was relaxing. Cabin with an amazing view! If you love to sit outside and listen to the sound of water while enjoying a glass of wine, this is the place! The deck has a hot tub with a view of the water and an out door fridge for beverages. Bruce has installed lights that shine down on the water for night time enjoyment. The inside was warm and cozy with a massage chair that was perfect after a day of hiking. The cabin was clean and the owners made sure we were happy and had everything we needed. We would definitely stay there again. We have 2-Sets of flood lights to turn on the river at Night to see all the activity on the river. We are only 1/2 Mi. to the real BAT CAVE, 2 Mi. from CHIMNEY ROCK PARK & 3 Mi. from LAKE LURE!! 12 Mi. from HENDERSONVILLE. Being so close to the water, you can really see nature at it's best. This REAR DECK is my favorite place on all of the property. Watching the river go by sitting on the swing that is on the deck or standing and watching the CHIPMONKS, OTTER, MINK, HERRING, DUCKS, BIRDS,BEAVER, WHITE SQURRILLS looking for their daily feeding is great. Peaceful and beautiful all at the same time. If you like fishing, you are as close as you can get. A NC. Fishing license is required you can call a 800 # to get if you forget. Hendersonville at our local Wal-Mart only 12 miles from the property. You are 2 miles from the town of Chimney Rock, great for shopping, or going up to Chimney Rock for the spectacular views of our area, or grabbing a bite to eat. You are 22 miles from Asheville (Biltmore House), or only 18 miles from Black Mountain. Due to Instant Quote being INCORRECT most times please contact us by Email for correct INFO. Morning Coffee in Hot Tub for 20-Minutes & 20-Minutes in Massage Chair start your day Right, Not just for night!